Much of the Mizati album ydna, released late last year, is a collection of slight elements aligned in unlikely combinations, among the most delectable of such combinations being those that mix emotionally remote piano lines with slender fragments of electronic percussion. There’s something special to how the piano here is almost inhuman in its simplicity, and how that spare quality allows for a camaraderie, a kind of cold simpatico, with the far more mechanized beat. The track titled, simply, “G” may be the highlight, its chords spaced apart to such an extent that they often decay fully before a new one enters in — an effect that is amplified, so to speak, as the close nears, when the decay fades into a drone that never quite seems to end (MP3). Pushing the album beyond being a straightforward experiment in minimalist pop are tracks that flirt with raspy techno, and others that employ unusual elements, such as saxophone and guitar. Get the full set for free download and streaming at tonatom.net, the releasing netlabel. More on Mizati, aka Andreas Groll, at mizati.de. excellent. this is definitely to my taste — thank you for introducing me to this artist. i’m a big fan of piano in music…the electronica elements are quite intriguing, like the raindrop-like percussion in “g.” i need to explore adding more artificial sounds like this in my own music. 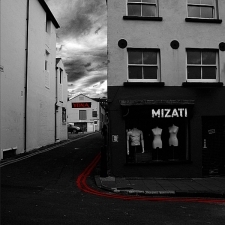 mizati is superbly talented at blending in the electronic stuff…it doesn’t immediately register as artificial or jarring. just fits the piece very nicely, but can still be picked out for its non-acousticness when concentrating on each element. thanks for this: its wonderful.